BRIERCLIFFE SOLDIER WOUNDED OFFICER'S TRIBUTE TO HIS COUREAGEOUS CONDUCT. Mrs. Greaves, of Kimberley-street, Briercliffe, has just received information that her son, Pte. Jas. 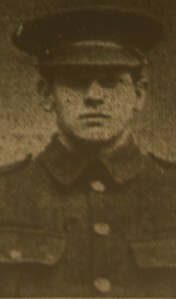 Greaves, of the 1/5th Loyal North Lancashire Regiment, was wounded on January 10th. His officer, 2nd Lieut. J.S. Crow, in a letter to Mrs. Greaves, wrote that her son was on very difficult work against the enemy, who were retaliating, and Pte. Greaves behaved courageously all the time up to being wounded, and afterwards too. There is no definite statement as to the nature of the wound, but the officer assures Mrs. Greaves of the heartfelt sympathy of all his officers and a wish for his speedy recovery. Pte. Greaves enlisted in September, 1915, and went out in August, 1916. He is now 23 years old.